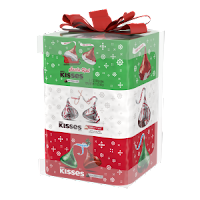 This Holiday Season Hershey’s has released Holiday Gift Cubes you can choose from Hershey’s Kisses and a 7.4 ounce cube, Hershey’s Miniature Assortment in a 7.4 ounce cube, Hershey’s Kisses Assortment Cube Holiday Gift Tower which includes Hershey’s kisses milk chocolates with festive red and green foils, Santa hat foils and candy cane foils in a 21.1 ounce cube, Hershey’s Holiday Assortment Cube Entertaining Tray, includes Hershey’s Kisses milk chocolates, Reese’s Peanut Butter Cups Miniatures and Hershey’s Miniatures milk chocolate bars in 22 ounce in last the one I got to review which is Reese’s Peanut Butter Cups miniatures Holiday Gift Cube 7.44 oz. inside are red, green, and gold foil wrapped Reese’s Miniature Cups. This is perfect to give as a gift just as the way it is as it’s beautifully wrapped in very festive for Christmas and the holidays and it fits perfectly inside of a Christmas stocking as well and such a great idea from Hershey’s.